It has been a tradition on this blog to take a look back at some of the places we visited last year. In Part 1, we posted photos of places we visited in the second half of 2018. Here are the places we visited in the first half. Click on the links, where provided to read more about the places of interest. There are usually a series of related posts per location, you can discover them easily in the calendar at the bottom of the post. Let’s see where we will go in 2019. While staying at Lindau, we went to see the Zeppelin Museum in Friedrichshafen. 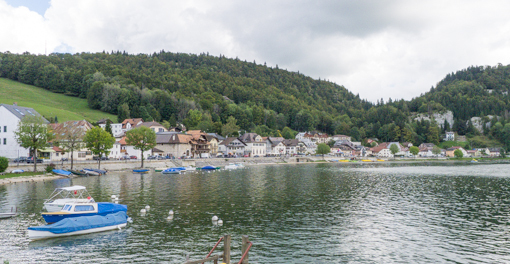 The industrial town is situated on the german shore of Lake Constance and west of Lindau. We saw a zepplin on the first day we arrived in Lindau. The museum presents on 4000 m2 of exhibition space its world’s largest collection on airship navigation: a multimedia narrative of history, courageous people, technical innovations and high performance. We used in this post much of the explanation of the museum from their web site which is here. We saw a short movie about the history of airship and the company which developed the technology. Ferdinand von Zeppelin established his famous dirigible factory at the end of the 19th century. The 128m-long LZ1 airship (Das Luftschiff) rose from its mooring on July 2, 1900. The first large exhibition hall on the ground floor is dedicated to the biggest and most famous Zeppelin airship: the LZ 129 Hindenburg. This partial reconstruction brings to life a flight to North and South America by airship that took place in the 1930s. This ship became the Hindenburg disaster which occurred on May 6, 1937, in Manchester Township, New Jersey, United States. The LZ 129 Hindenburg caught fire and was destroyed during its attempt to dock with its mooring mast. Of the 97 people on board, there were 35 fatalities (13 passengers and 22 crewmen). A variety of hypotheses have been put forward for both the cause of ignition and the initial fuel for the ensuing fire. Photo taken from wikipedia. The disaster was recorded on film and widely distributed. The event shattered public confidence in the giant, passenger-carrying rigid airship and marked the abrupt end of the airship era. Despite the disaster, it is clear that the frame is an amazing piece of engineering. 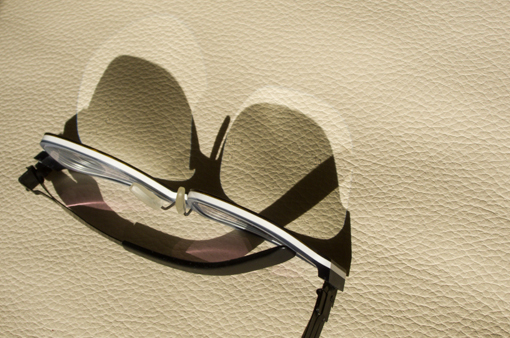 Intricate and precise. Perhaps, this is a reason why steampunk is almost believable. Besides the preparations required for the journey, it visualizes the luxury at the time on board the flying hotel. Via the drop-in ladder you can climb into the real-life passenger compartments of the LZ 129, which have been recreated according to historical plans. It was noted that the interiors were designed according to the Bauhaus school in 1930’s – so the airship really incorporated state-of-the art design and technology of the time. In the permanent exhibition, flying is explained graphically using the principle of “lighter than air” and made tangible at experimental stations. The successful history of the Zeppelin Group and its pioneers shows how technical innovations have emerged and the cult of Zeppelin has been celebrated for over a century. There was a display of numerous zeppelin-inspired objects, e.g., pens, etc. We took a coffee break at the cafe. Other aviation companies, including Maybach, also arose in Friedrichshafen to help service the industry, which received a major impetus from World War I. Old poster about identifying British versus German military aircrafts in World War I. 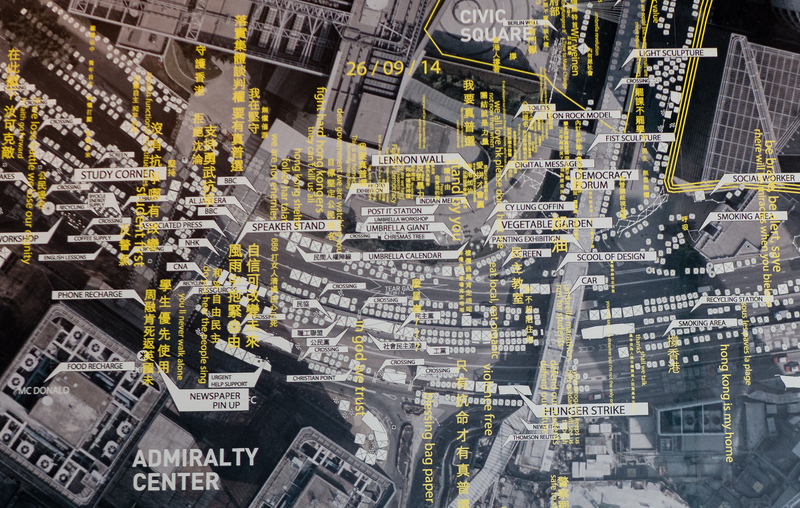 The exhibitions on the period from 1933 to today is mostly about the integration of the company into the Nazi and the WWII economy, the destruction of Friedrichshafen, and the reorganisation and redevelopment of industrial enterprises after 1945. Because of its industrial output, Friedrichshafen was heavily bombed during the war. This aerial photo shows a decimated factory complex and all the bomb craters around it. The company is still in existence and has diversified into various light and heavy industries, e.g. ZF Group that makes gear box for cars. It was a really interesting visit as we know so little about zepplin before. Too bad it was too late to join a flight. I will try to do it next time. The museum is located in front of the harbor and we took a ferry back to Lindau. Nice visit. While on Lindau, we went to Eli.Gut.Halle for dinner. 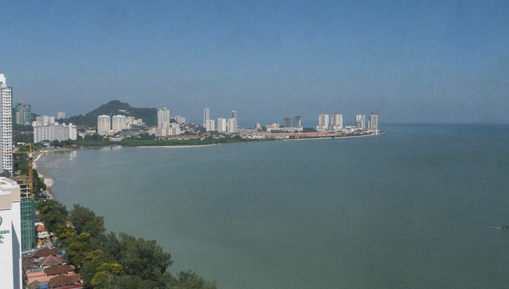 It is located close to the lighthouse at the end of the promenade. Offering outdoor and indoor seating, it has both a view of the harbor and the lake. Here is a view of the harbor of Lindau – the lighthouse, the lion and the tower (from right to left). There are more pics of the harbor in our last post. We were there when the sun was setting, and the sky was beautiful. The restaurant is attached to a lounge/event space, a bar and a gallery of sports cars. There is a meeting area upstairs. From above, one could see the top tier of cars at a better angle. The theme is obviously sports cars, but not all of them are vintage. Most cars are German made understandably. 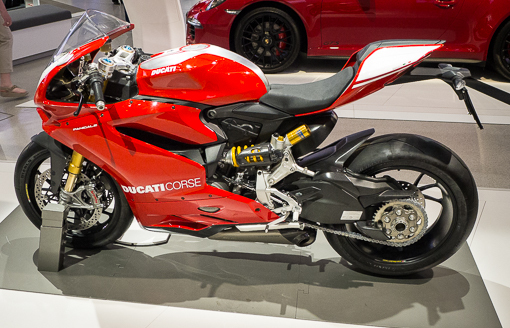 A few English and Italian. Surprisingly, we did not see a BMW. Munich being the birthplace of BMWs is not far away and we were in Bavaria. What I have not seen/heard before is a Porsche-branded tractor – fire-engine red. The food was good, not touristy. Go for a drink if you are in town. 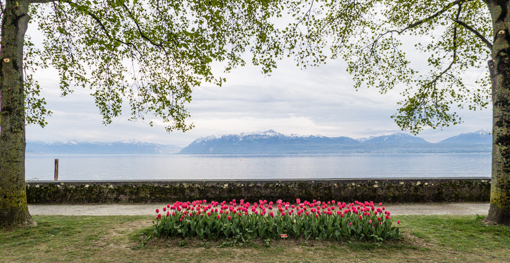 In May, we went to Lindau with IT. Lindau is a small island in Lake Constance (Bodensee), located near the meeting point of the Austrian, German and Swiss borders and is nestled on the lake in front of Austria’s Pfänder mountain (see later post). We took this aerial photo when flying from Zurich to Kiev after our visit to the island, and recognized it immediately. Lindau is connected to the mainland on the north shore by a road-traffic bridge and a railway dam. We did not drive and came by train from Switzerland. The station on the island is an old building and has its charm. Lindau Hauptbahnhof are connected to Friedrichshafen, Munich, Ulm, Augsburg, Bregenz and Zürich by train services run by DB, OBB and SBB. Our hotel is in front of the harbor on the promenade. Very scenic and lively. One morning, a small orchestra played on the harbor front outside our hotel. Lindau is old. The first use of the name Lindau was documented in 882 by a monk from St. Gallen (which we visited after Lindau, see later post). The name Lindau means “island on which linden trees grow”. Traditionally, it is popular for tourists from the southern parts of Germany. A well-known landmark in this southwesternmost city of Bavaria is the harbor entrance with Bavarian lion and new lighthouse. The six-meter-high lion, watching over Lake Constance, is the work of a Munich professor Johann von Halbig. Completed in 1856, it consists of sandstone and weighs about 50 tons. We strolled to the end of the breakwater on the side with the lion and looked across to the lighthouse. The lighthouse is relatively new, 36 meters high and measures a base circumference of 24 meters. 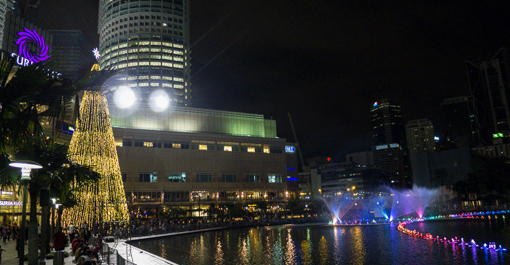 Apparently, it is one of the few structures of its kind which has a clock in the facade. Looking back towards the harbor, the Mangturm tower can be seen on the left in the photo below. Our hotel is just behind it. This tower used to be a square stone building was built in the 12th century as part of the medieval city fortification. There are cars on the island but only a small number as the streets are old and narrow. 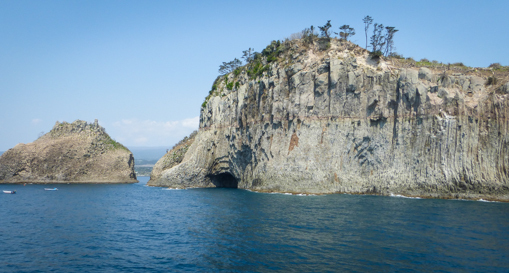 The island is charming for that reason. Apparently, the Nobel Laureate Meetings began here in 1951 and brings many Nobel Prize laureates to Lindau each year. Students from all over the world are able to meet up with Nobel Laureates to discuss scientific developments. The Old Town Hall (Altes Rathaus) was built from 1422 in Gothic style – the work on the impressive building lasted 14 years. It also houses the former Imperial City Library (Reichsstädtischen Bibliothek) in Lindau. It was Martin Luther who in 1524 called on the “councilors of all German cities” to create “good books or librareyen books” – and his appeal was heard here in 1538. The library houses a colored copy of the first complete German Bible translation of Martin Luther from 1534 which has been put on display in autumn 2013 and protected by a huge climate-stabilizing glass cube. 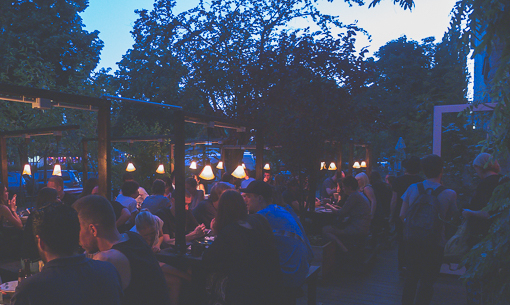 The welcoming biergarten on the island. It must be packed with very happy people today as this is posted. Lindau is a jewel on Lake Constance. Comfortable, relaxing, and cultural. We will come back one of these days. Last year, IT and I went to visit the Vitra Campus – located just across the Swiss-German border in Weil am Rhein. 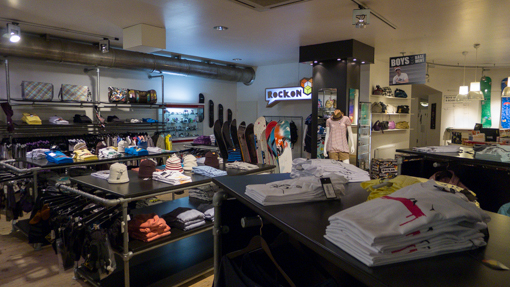 See our earlier posts about the Campus and the company’s showrooms. We joined a walking tour of the private areas of the Campus – the factories, the warehouse and the fire station. Zaha Hadid’s first completed building is perhaps the most famous fire station in the world. The building was commissioned after a disastrous fire at the Vitra factory in 1981. Completed in 1994, the building housed a garage for fire engines along with another wing containing locker rooms, showers and common areas. The slanting walls are not caused by my camera, they do not meet at right angles. The sharp-angled sculptural forms yells “emergency!’ The walls seem to glide past each other. This building is a key work of so-called Deconstructivism and of late twentieth-century architecture in general. For architecture pilgrims, the Vitra Campus is a mecca and this fire station is a high point. Since it no longer functions as a fire station, we were invited inside to sit in the conference room. The fire station represents the earliest attempt to translate Hadid’s fantastical, powerful conceptual drawings into a functional architectural space. This Fire House project – a complex construction of tilted and clashing planes – looks very different from her later, organic designs. Vitra’s voluntary fire fighting team decided to co-operate with the professional city fire brigade and dissolved the factory-based fire fighting teams. As a consequence Vitra no longer needed a fire station and the building became a space for lectures, concerts, and exhibitions. Hadid was the first woman to receive the Pritzker Architecture Prize, in 2004. She worked for her former professors, Koolhaas and Zenghelis, at the Office for Metropolitan Architecture, in Rotterdam, the Netherlands, becoming a partner in 1977. Hadid established her own London-based architecture practice in 1980. On 31 March 2016, Hadid died of a heart attack in a Miami. We did a post about her building in Hyde Park, London (here) shortly after her death. This is the third post on what we saw at the Vitra Campus. The Vitra Design Museum is one of the publicly accessible building on the Campus. 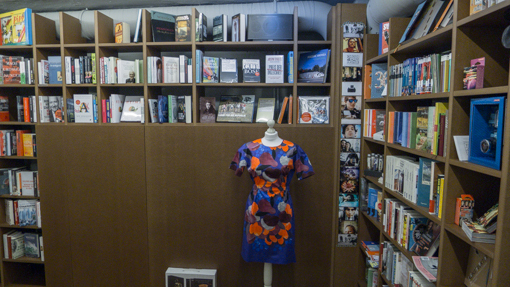 A major retrospective – “Alexander Girard – A Designer’s Universe” was installed when we visited. Much of what is written below came from their web site which is very informative. The Vitra Design Museum was founded in 1989 by the company Vitra. It is housed in a building by Frank Gehry (who else ?). Next to it is a gallery also by Gehry, where we saw an exhibition about the Umbrella Movement in Hong Kong (see that post here). The work of the Vitra Design Museum is based on its collection, which encompasses not only key objects of design history, but also the estates of several important figures (including Charles & Ray Eames, George Nelson, and Verner Panton). It is dedicated to the research and presentation of design, past and present, and examines design’s relationship to architecture, art and everyday culture. Originally envisioned as a private collector’s museum, major internationally acclaimed exhibitions were presented later, including retrospectives on Charles and Ray Eames, Frank Lloyd Wright and Luis Barragán. It developed its own product lines to finance its activities and an independent publishing house was established. Alexander Girard (1907-1993) is renowned for its fabric designs and collection of folk art. In 1951, he was appointed as the director of Herman Miller’s textile department. He recognized an impulse in folk art, based on a universal human heritage of patterns, motifs and design techniques that transcends the limits of time and place. Girard donated over a 100,000 pieces of folk art to the Museum of International Folk Art in Santa Fe, New Mexico. A new wing was built at the museum—which Girard designed—to house the collection. Vitra is licensed to make a range of products bearing his graphic designs as well as a series of collectible wooden dolls. 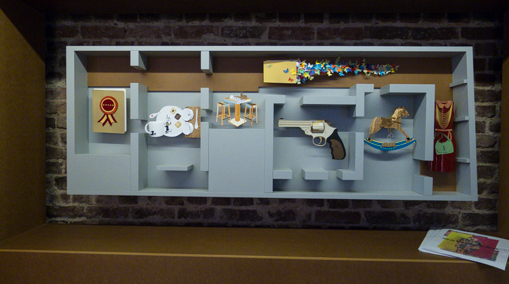 Check out the web site of the Girard Studio to see more of his works. VitraHaus is Vitra’s flagship store on the Campus. One can see, touch, compare, test, and buy all of Vitra’s home and office furniture offerings here. We visited the Campus last year and this is the second of four posts. See the Campus overview here. Most of what is written below came from their web site which is very informative. Designed to display the furniture brand’s Home Collection, the five-storey building consists of stacked volumes with pitched roofs covered in charcoal stucco. The company commissioned Basel-based architects Herzog & de Meuron in 2006 to design the VitraHaus. Each gabled end is glazed and cantilevers outwards up to five metres, creating the impression of a pile of houses. A lift takes visitors to the fourth storey, where we started the circular tour. On that day, it was a space completed in different degrees of pink. Internally, spiral staircases connect the intersecting interiors. The furniture showrooms are seamless as one moves from one area to the next. The lower floor is dedicated to office furniture. In addition to the display area for the company’s products, there is an exhibition space for the chair collection of the Vitra Design Museum. These collectible miniatures are everywhere in this building. One can order a custom-made Eames chair at the Lounge Chair Atelier. The choice of every component can be made by the customer. 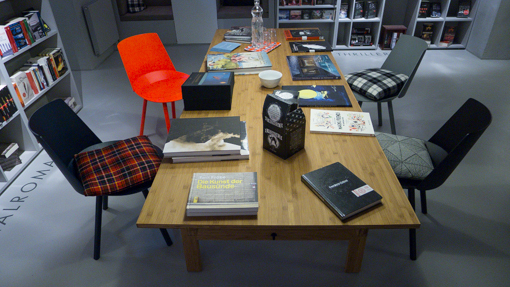 There is also the Vitra Design Museum Shop and a café with an outdoor terrace. There was so much to see and buy in this building. According to their website, the VitraHaus has a daytime view and a reversed night time view. During the day, one looks out onto the green landscape, but when darkness falls, the illuminated interior of the building glows from within, while its physical structure fades out. The glazed gable ends turn into display cases that shine across the Vitra Campus. We did not stay late enough to see it. Last year, IT and I went to visit the Vitra Campus – located just across the Swiss-German border in Weil am Rhein. Much of what is written below came from their web site which is very informative. They also have a great drone video of the campus here. The Vitra Campus comprises a public and a private area. In the public space, you will find the Vitra Design Museum, the VitraHaus and the Vitra Silde Tower. The private area, where the production facilities are located, can only be accessed as part of an architectural tour (on which these photos were taken). In 1981, a fire destroyed the majority of the production facilities used by Vitra. The resulting reconstruction provided an opportunity to produce various buildings with renowned architects. The company decided to built its own firehouse. The Vitra Fire Station was the first full-scale work by Zaha Hadid ever to be realised. See later post. Nicholas Grimshaw was chosen as the first architect to rebuild the Campus. As the insurance funds only covered a six-month interruption in production, Grimshaw designed a factory constructed from simple prefabricated metal elements. The horizontally striated façade made of corrugated sheet metal bears witness to the industrial purpose of the building as well as the technological competence of the company. The Vitra Design Museum building was designed by the American architect Frank Gehry as his first project in Europe. See later post about this museum. Designed by the Japanese architectural office SANAA, the Vitrashop Factory Building was completed in 2012. The building has a nearly circular footprint and consists of two adjoining semi-circular concrete shells. The flowing character of the building’s exterior is created by a white curtain façade made of undulating acrylic panels. Although the production hall is larger than any of the other factory buildings on the Vitra Campus, the façade gives it a light, almost floating appearance. The Schaudepot is the second building on campus by the architects Herzog & de Meuron. The new structure was not yet opened when we visited but opened later in 2016. It combines the simple appearance of an industrial building with the complex requirements of a walk-in museum repository. 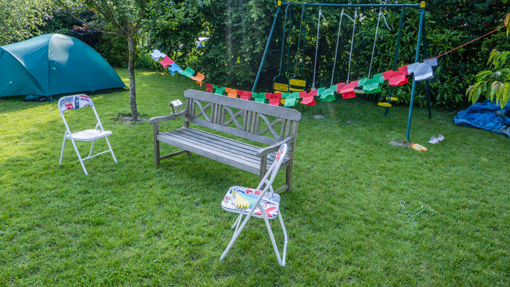 The sculpture was commissioned by the children of Vitra company founder Willi Fehlbaum as a gift for his seventieth birthday. It depicts the three main tools employed by upholsters who play a central role in the production of furniture. Petrol Station. Jean Prouvé was an important engineer, architect and designer of the post-war era. He developed furniture and buildings based on carefully constructed metal structures produced in his own metalworking shop. The Conference Pavilion by Tadao Ando was the architect’s first work outside Japan. The centrepiece of the building consists of a sunken courtyard that seems to conceal the surrounding environment and lends the building an almost monastic tranquillity and intimacy. Posts to come will cover the VitraHaus, Design Museum and the firehouse. Dear Readers, Happy New Year ! Continuing with our first post of 2016, this post takes a look back at the places we visited in the first half of last year. In 2015, there were 94 new posts, growing the total archive of this blog to 650 posts. The post that had the highest number of views in 2015 was about our visit to a durian stand in a night market in Malaysia. Click on links, where provided to read more about the places of interest. There are usually a series of related posts per location, you can discover them easily in the calendar at the bottom of the post. 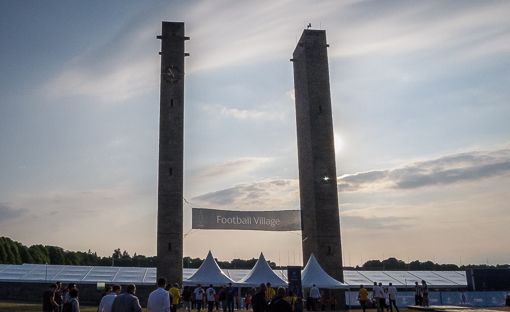 After the UEFA Champions League Final game on a Saturday in June (click here to see the post), we stayed an extra day in Berlin. As expected on a Sunday, most of the shops were closed. 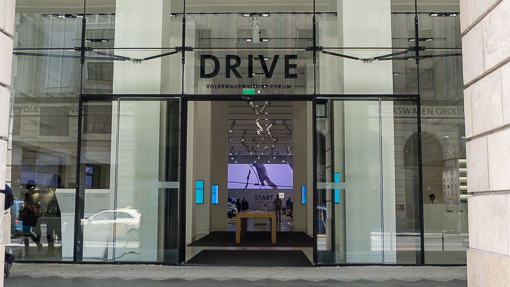 So we were pleased to discover Volkswagon Group’s “flagship” store, not far from Checkpoint Charlie on Friedrichstrasse 84/Unter den Linden. See the Forum’s site here. Apparently, it was only a month old when we visited in June 2015. 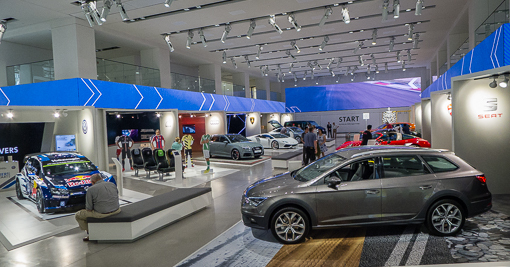 Following extensive remodelling with a completely new design, the former Automobil Forum reopened with all of VW group’s twelve brands under one roof. 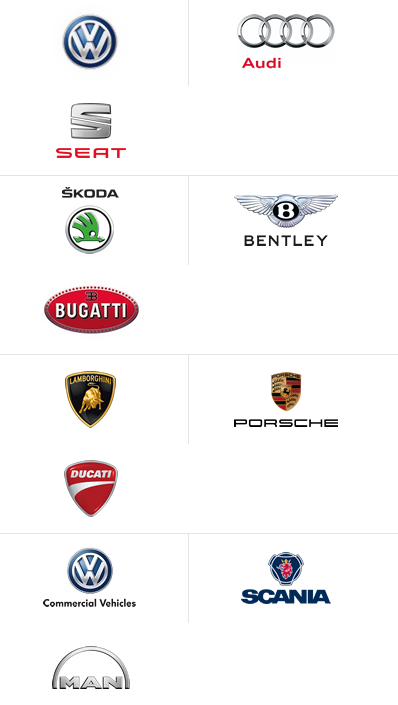 The Volkswagen, Audi, SEAT, ŠKODA, Bentley, Bugatti, Lamborghini, Porsche, Ducati, Volkswagen trucks, Scania and MAN brands are presented. 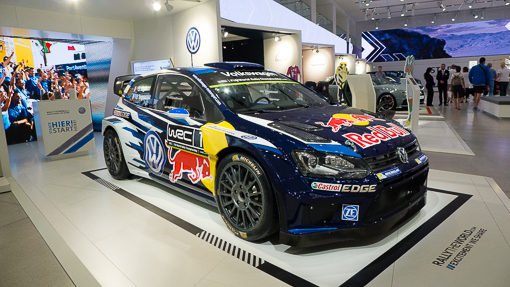 The VW brand was represented by a rally race car. 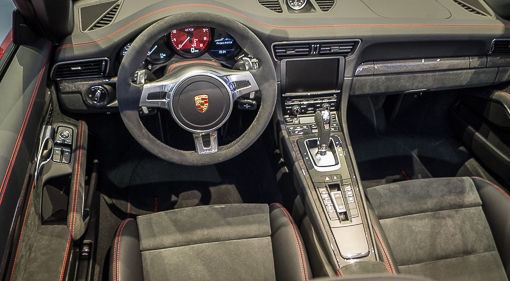 Apparently, all Porsche dashboard looks the same. In Europe, more than one in four cars are made by the group. Volkswagen Aktiengesellschaft is the largest company in Europe, apparently, and this is their communication platform on mobility. Not following auto news, we had no idea that Lambo and Bentley are both VW brands. 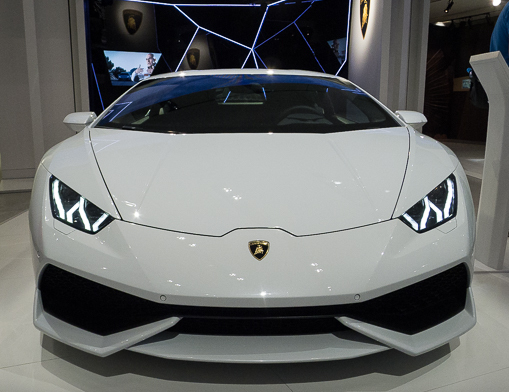 The Lambo’s shark look is comical, as is the over-tanned rolly polly Bentley. The Group operates 119 (May 26, 2015) production plants in 20 European countries and a further 11 countries in the Americas, Asia and Africa. Every weekday, 592,586 employees worldwide produce nearly 41,000 vehicles, and work in vehicle-related services or other fields of business. 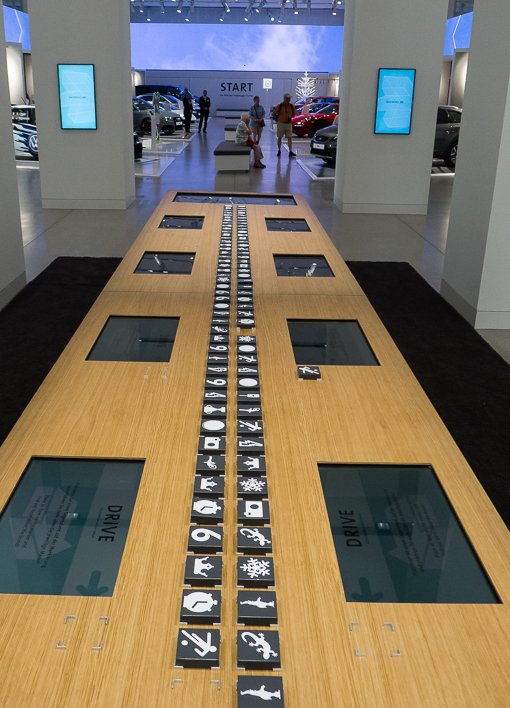 The Volkswagen Group sells its vehicles in 153 countries. 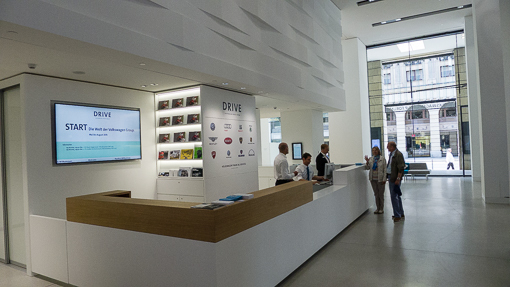 Interacting with digital exhibits, the visitors can discover both the past and present of the Volkswagen Group. Of course, they are selling the brands here not the actual cars, but they sell books and other branded paraphrenalia. 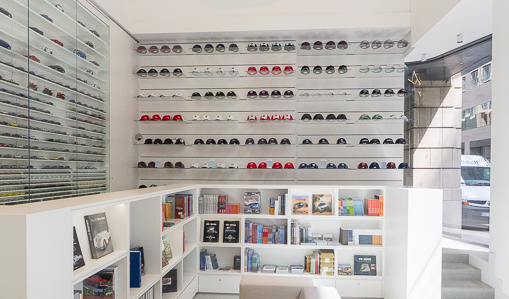 But the range of merchandise here pales in comparison with what was on offer at BMW Welt in Munich (click here to see the post). There were several walls full of miniature models on display. The model cars were not available for sale. They serve a documentary purpose. 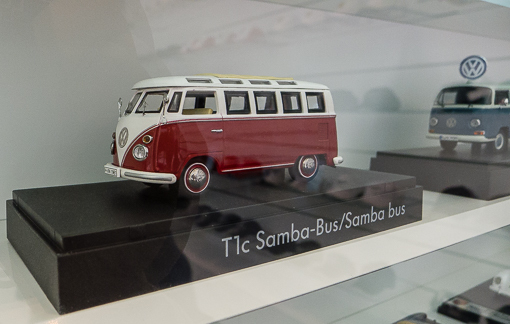 Volkswagen started producing Sambas in 1951. In the sixties this version became popular as a hippie bus. Instead of a sliding door at the side the Samba had two pivot doors. In addition the Samba had a fabric sunroof. At that time Volkswagen advertised with the idea of using the Samba to make tourist trips through the Alps. Sambas were standard painted in two colors. Usually, the upper part was colored white. The two colored sections were separated by a decorative strip. Further the bus had a so-called “hat”: at the front of the van the roof was just a little longer than the car itself to block the sun for the driver. 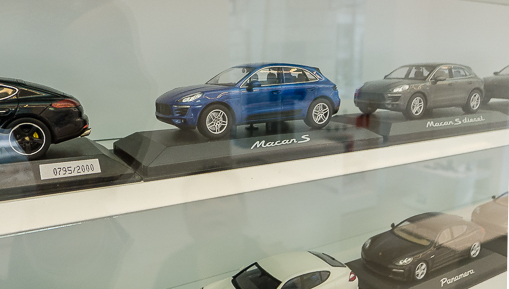 We assume they would make a model only if the real car existed – but Porsche police car ? Only in Germany ! The forum offers conference spaces and two restaurants – the eateries sounded interesting but we did not have time to try them. A fun place to spend half an hour. 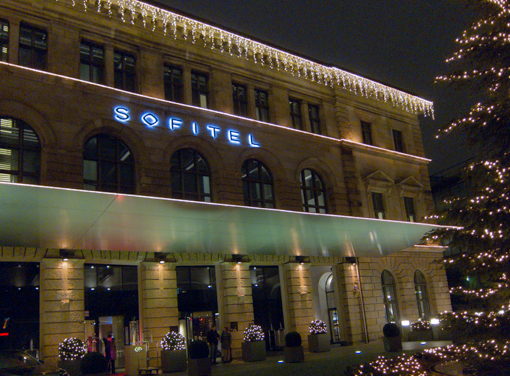 Just a quick post about what we ate while in Berlin. The places mentioned in these food diary entries are all memorable for various reasons and definitely recommendable. Don’t remember why we wanted to have ramen in Germany. 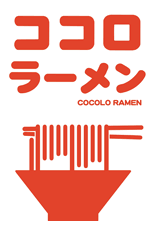 IT’s friend recommended this place Cocolo Ramen in Kreuzberg. Since we were hungry, we took a cab from our hotel (near the zoo) to Kruezberg, an area with a lot of immigrants and a canal runs through it. 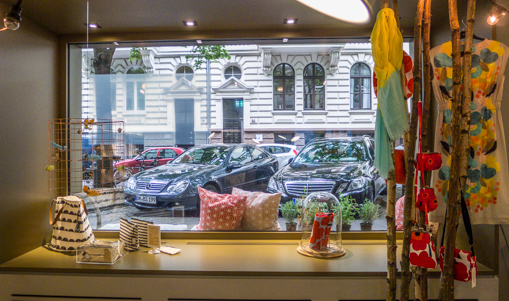 The restaurent is on Paul-Lincke-Ufer. We were sure the driver did not take the most direct route. This area feels a bit like the canal area in Milano – numerous bars and restaurants line the sides of the canal, very local and without the touristy fares. Click here to see our post on the Naviglio Grande in Milano. Cocolo was packed on the outside since the weather was agreeable. We quickly found a table inside next to a big window. The locals must love it because the inside was quickly filled up too. 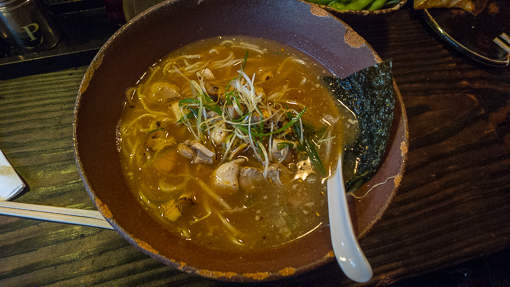 Standard ramen on the menu. Nothing surprising. 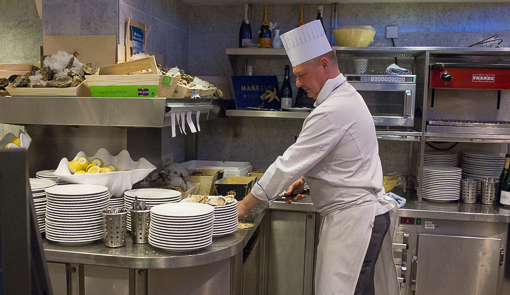 Authentic and tasty is how we would describe it. 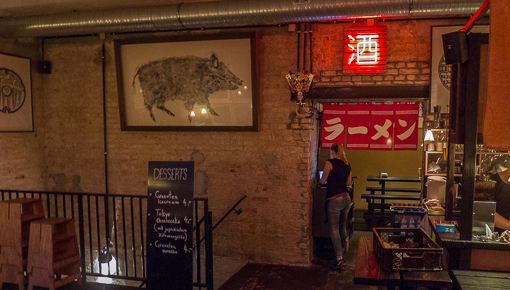 Definitely worth the trip seeking it out if you crave ramen in Berlin. 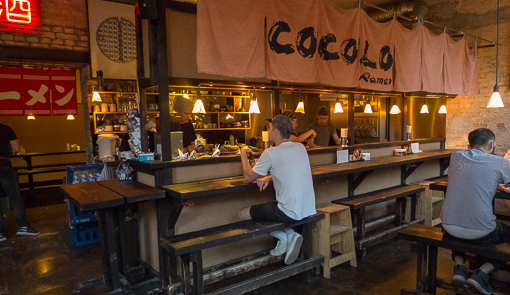 But on the next day, we found a second Cocolo (probably its parent) in Mitte. Cocolo is apparently a growing enterprise. 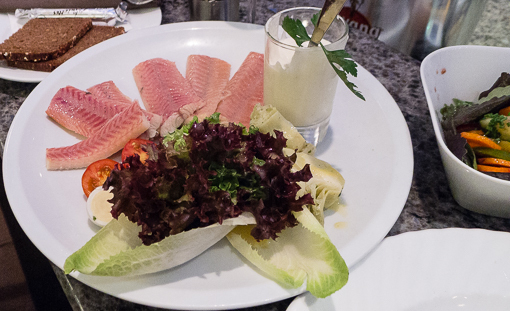 Just a couple of short posts about what we ate while in Berlin. The places mentioned in these food diary entries are all memorable for various reasons and definitely recommendable. 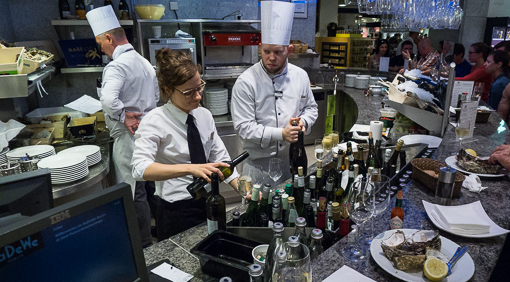 KaDeWe is a large luxury department store in Berlin, equivalent to Harrods in London or Shinsegae in Seoul. They have the most extensive gourmet food retail area on the entire 6th floor. I(Chris) had sang praises about this place in earlier posts, some of which reported on my attempt to count how many different types of sausages were available for sale in the store. If you are curious, click here and here to find out. At that previous visit, I was by myself and chose to enjoy a bowl of bouillbaise on a bar dedicated to serving this dish. Click here to see it. This time, there were four of us, and since all the food bars were serving interesting and delicious-looking dishes. It took us quite a bit of walking around and debate among ourselves before settling down for the seafood and oyster bar, Austernbar. The place was packed and the staff was very energized. 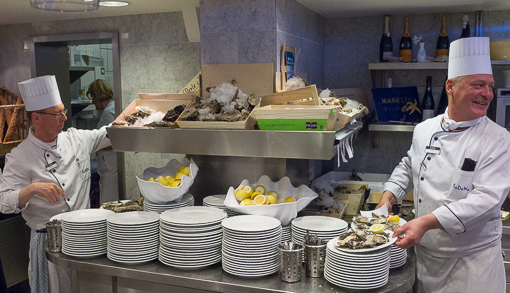 One guy’s job was mostly opening oyster – he used a long hinged blade fixed onto the counter rather than a small shucking knife. He had to be fast. See the orders in front of him. 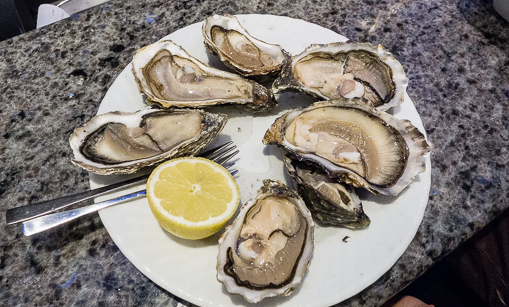 The variety of oysters on the menu was extensive – originating from Scottish waters (which was the tastiest in our opinion) to French Atlantic coast, around Sylt, and the Mediterranean, etc. We had a sampler of six different kinds. 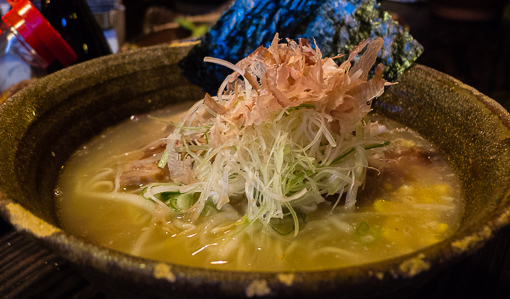 IT had the smoked eel which was very tasty – just the right amount of smoky flavor with a touch of natural sweetness. 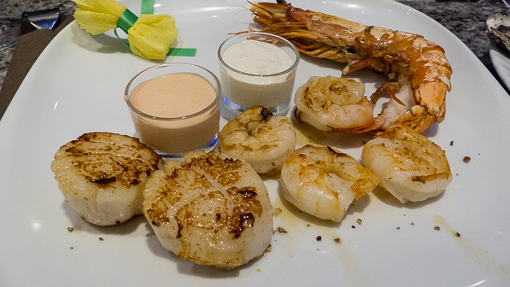 We also had a couple of grilled seafood platters. Yummy. Definitely a fun place to have a chilled glass of champagne and oysters. 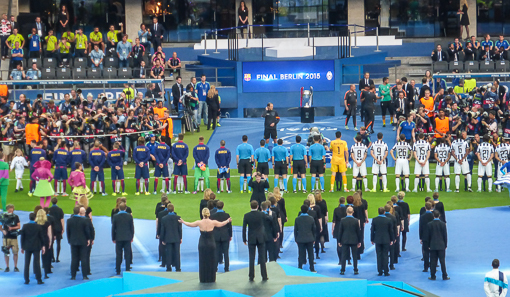 This June, we were the lucky guests of IT again for the UEFA Champions League Final 2015 which was held in Berlin, Germany. Beside Sue and IT, we were joined by MW(HK) and MI(CH). 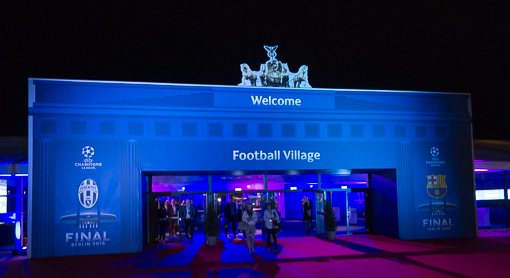 We arrived at the Olympiastadion around dusk after much traffic congestion, despite being transported in a VIP bus provided by the game’s sponsors. 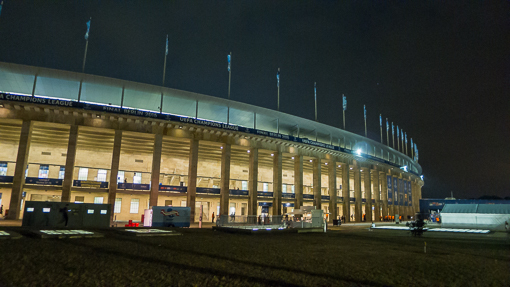 The Olympiastadion was built for the 1936 Olympic Games, the 11th Summer Olympics. Adolf Hitler wanted to use the stadium for propaganda and ordered the construction of a new sports complex rather than renovating an existing Deutsches Stadion. We waited quite a bit on the outside before being let in through a VIP entrance. As we learnt afterwards, there were as many as 5000 counterfeit tickets in circulation and UEFA was trying to deal with it outside the stadium. The stadium was renovated in 2004 and hosted 6 matches including the final for the 2006 FIFA World Cup. 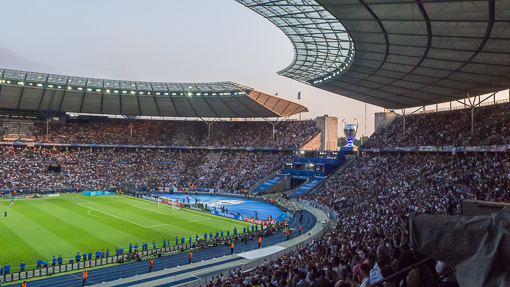 Its capacity is about 75,000 spectators – the largest football stadium in Germany. 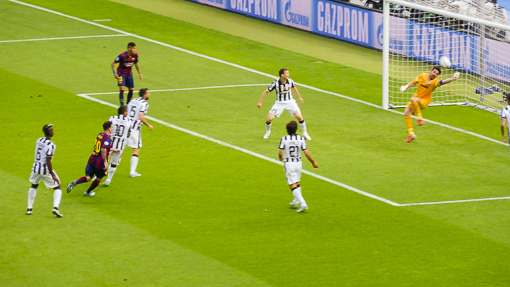 The two teams in this year’s Champion League final are FC Barcelona, Spain and Juventus from Torino, Italy. Juve was the underdog team. We had seats in midfield, half way up the side facing the player’s entrance. 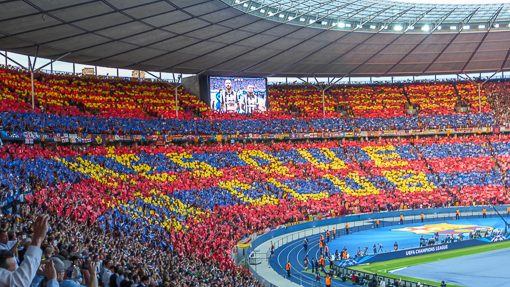 The Barça fans are on our left and Juve fans on the right. 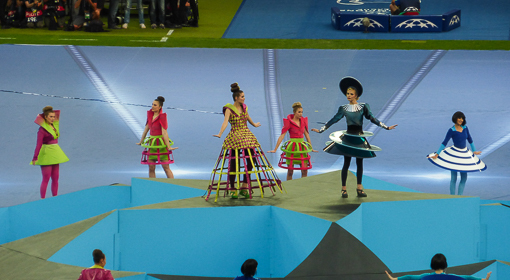 The game started with a short opening ceremony. Having been to Camp Nou – the clubhouse of FC Barcelona (click here for the post), I(Chris) knows the Barça team better. Now they have 3 South American star players – Messi, Neymar and Suarez. The game was very exciting, top-level play, without excessive pushing or tripping. We were truly surprised when the half time whistle was blown as the game was so engrossing that we did not even look at our watches. 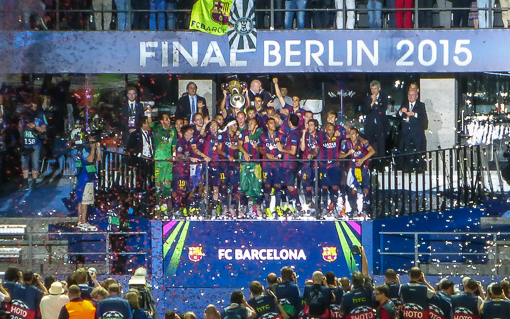 Barça won the game 3-1, being the overall better team. 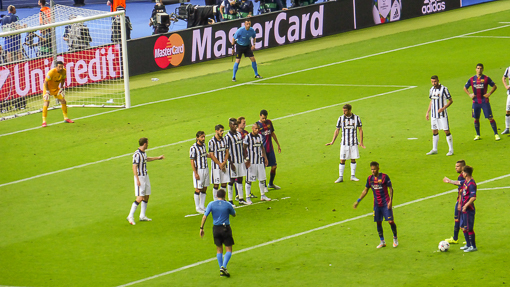 Juve had its moment after they scored an equalizer but their high spirit was quickly lost when Barça scored its second goal. Even before the third goal was scored in the last minutes of the game, it was all over for Juventus already. This was our third attendance of a Champions League final game (lucky us) and this game was the most enjoyable to watch. 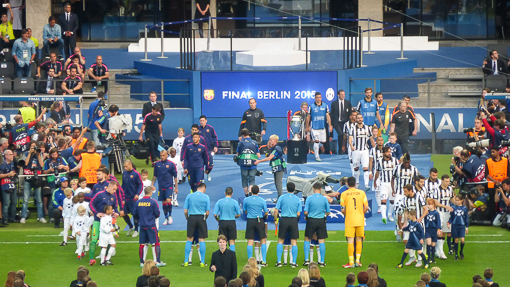 We saw the other two games – 2012 in Munich (Allianz stadium, Chelsea beat Bayern Munich, click here to see us holding the actual cup before the game and also here) and 2013 in London (Wembley, Bayern Munich beat Borussia Dortmund, click here). 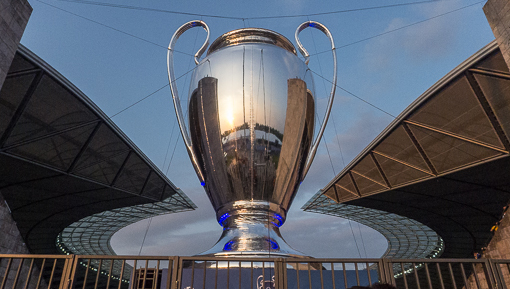 The stadium and hospitality service in Berlin was better than Wembley and on par with Allianz. H a p p y 2015 ! 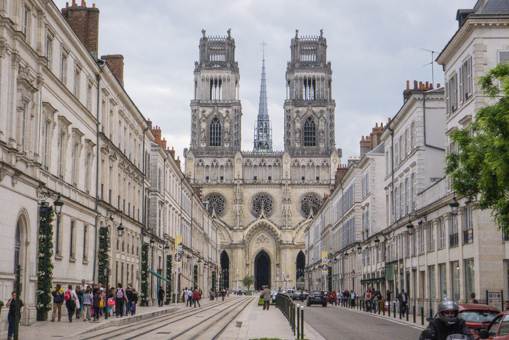 Now that we are back from our year-end vacation, we are taking a look back at some of the places we visited last year. This is the second of two posts; Part 1 is here. The photos are organized in reverse chronological order. Some of the trips are business trips and some are vacations. Click the links where provided to see the actual posts. There are usually a series of related posts per location, they are uploaded around the same time – you can discover them easily in the calendar at the bottom of the post. 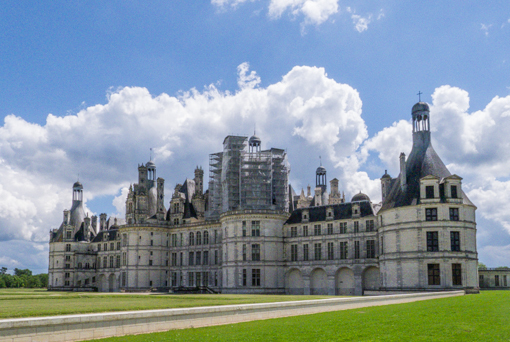 June 2014 – Val de Loire, France – It was a road trip with our “new” car and we saw V and her families. Chez Liz, Orleans – thanks, we had a great time seeing every one. 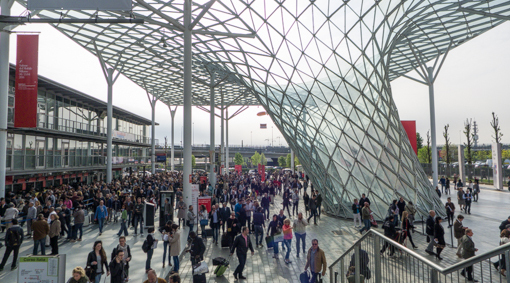 April 2014 – Milan, Italy – I (Chris) went to see the Salone Internazionale del Mobile. 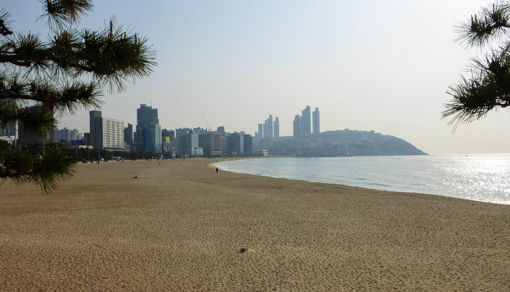 April 2014 – Korea – Sue went with her family for a tour. 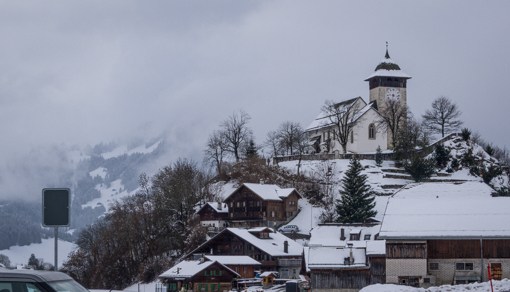 February 2014, Chateau d’Oex, Switzerland with IT who came to see ballet, eat fondue and buy accordion. January 2014, Times Square, New York. 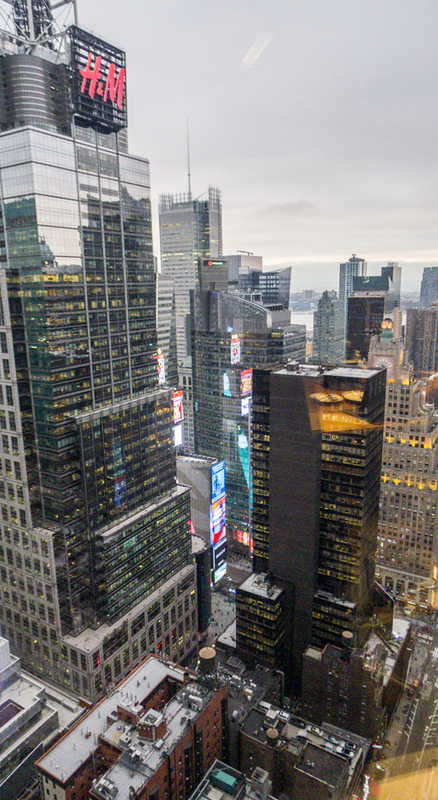 I (Chris) took this from the building where I worked many years ago on the corner of Sixth Avenue and 44th street. We are wondering where we will go in 2015. This is our first post of 2015. 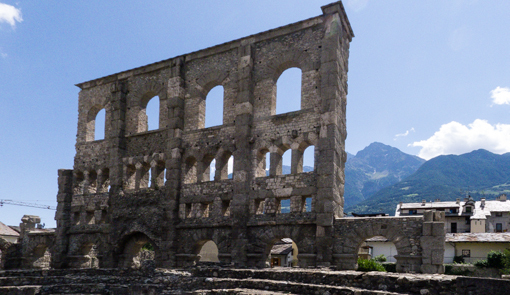 It is time to take a look back at some of the places we visited last year. 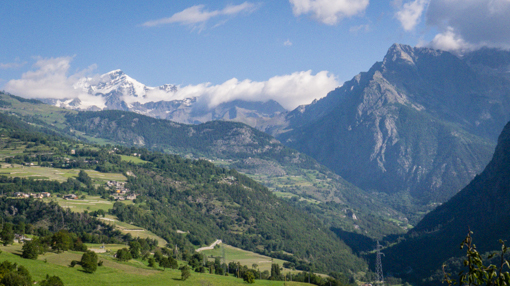 Some of you who knew me from New York probably think, judging from the posts here, that since we left for Switzerland, we travel a lot and do not spent much time on work. While it is true that I (Chris) get more vacation days per year now, workload is certainly heavier than before. So these vacations are really important counterbalances. The photos are organized in reverse chronological order and there is a part 2 to come. Some of the trips are business trips and some are vacations. 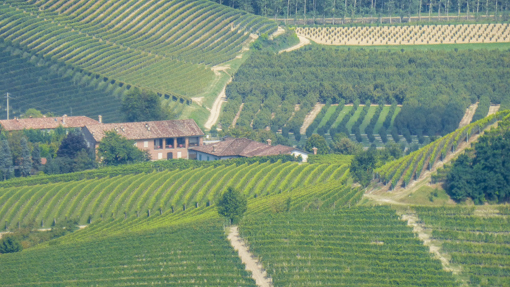 There are usually a series of related posts per location, they are uploaded around the same time – you can discover them easily in the calendar at the bottom of the post. We left on Christmas eve for Malaysia. The photos are being selected and touched up as we type. 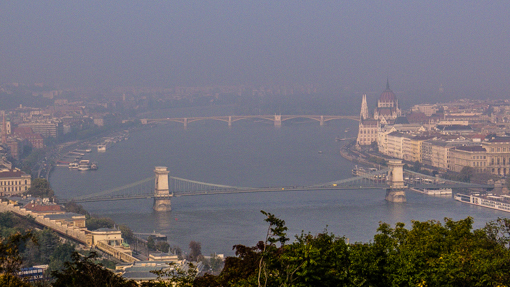 Photos from first half of 2014 to come. My (Chris’s) eyesight is not getting better and as a result, I have to change the prescription on my lens – it is getting thicker but not quite coke-bottle thick. 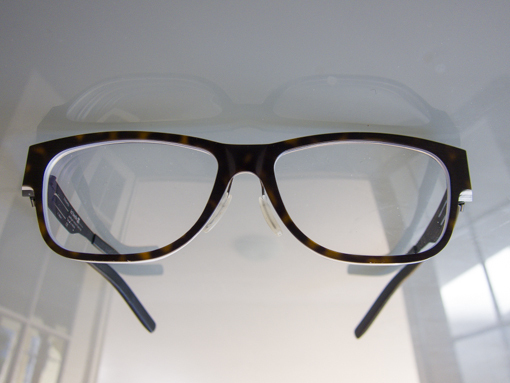 I changed my glasses about six months ago. I wrote about my loyalty to the ic! 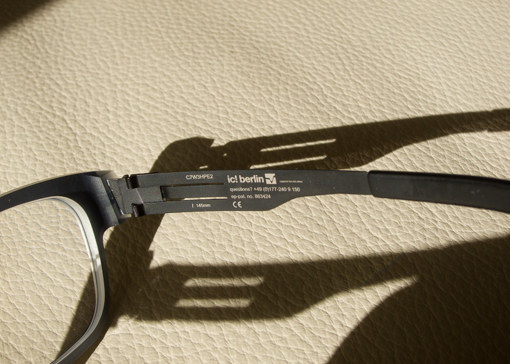 berlin brand of eyeglass here – click to see the other models I wore in the last 8 or so years. I am sticking with this German, handmade-in-Berlin (handgefertigt in eigener herstellung, berlin) brand a third time around. In retrospect, the shape and curvature of my first pair were quite special; the second and now third are quite similar to each other and somewhat conventional. 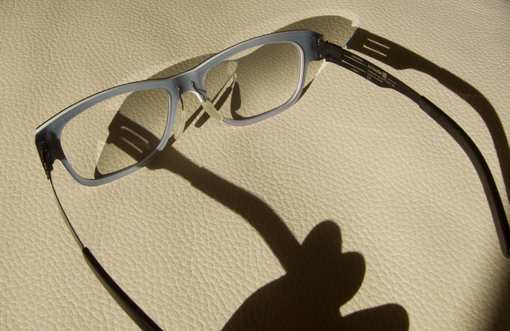 It was a bit of a decision since they are well known for their light-weight frames made with sheet metal, as were my two earlier purchases. Now I am trying one of their plastic model. The plastic model still uses their unique screw-less hinge that works by the springiness of the metal. Having a white middle layer seems very popular at the moment as many brands are coming out with it. 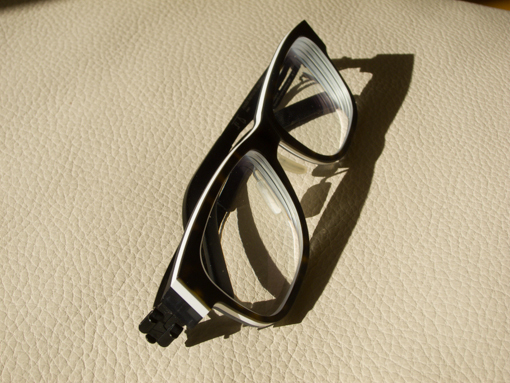 The frame is made with a three-layer sandwich of acetate resins – the one closest to the face is translucent light grey-ish blue, the middle layer is white and the outermost is imitation turtle shell. 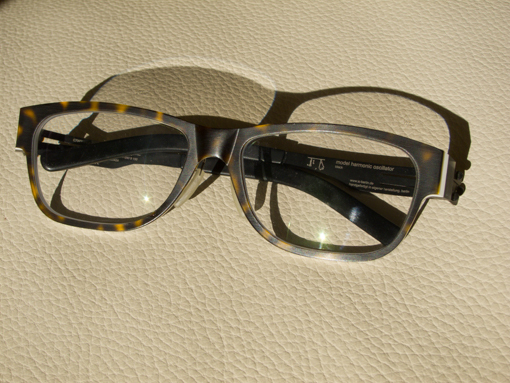 It is a big, size 56 frame. The frame did not come with a nose bridge but the store ordered one from the factory specially for me. 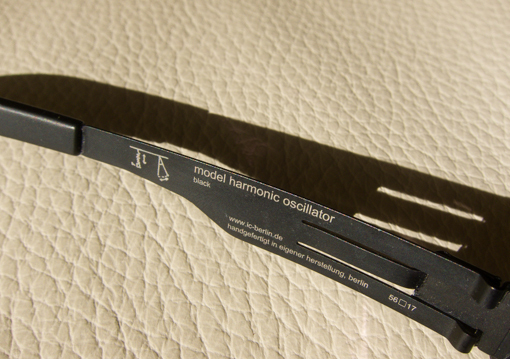 The model is named Harmonic Oscillator and there is even a little diagram etched on the inner side of the frame to illustrate the concept. I have no idea how this concept is connected with the design of this frame. 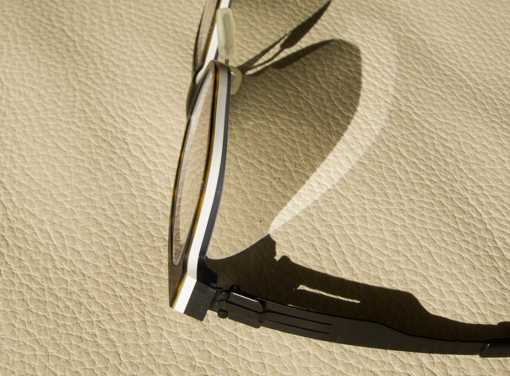 My first pair was named “roman” and the second pair was named “hotel neutor”. 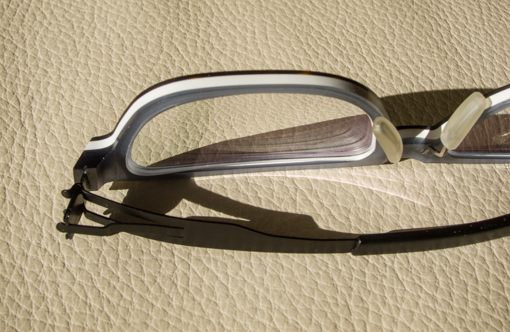 The limbs of the frame are partially metallic and are finished with a matt brown coating (it says black although it is really dark dark brown to me). 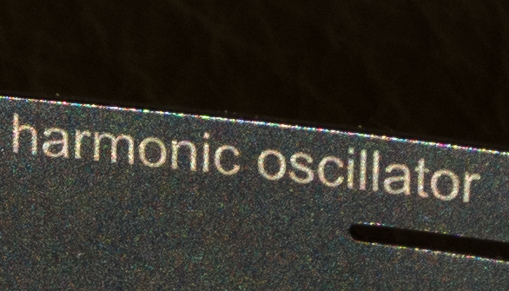 On closer inspection, the coating on the metallic part reflects multi-color light. Look at the spots of colors on the edges. I am quite happy with it and hopefully my eyesight does not deteriorate too quickly. The brand’s website is here. It appears that they now offer a factory tour, I will definitely check the place out when I am next in Berlin (hopefully in May 2015). 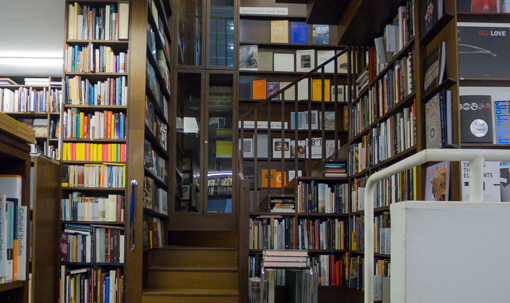 Several posts here are dedicated to the bookstores I have visited in other cities. 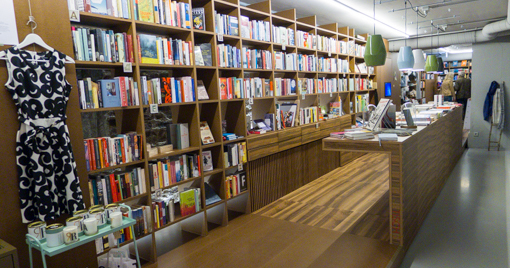 For example, MIT Press bookstore in Boston and Livraria Cultura in Iguatemi, Saõ Paulo. This is my second post on a bookstore in Köln. The first one on Siebter Himmel is here. 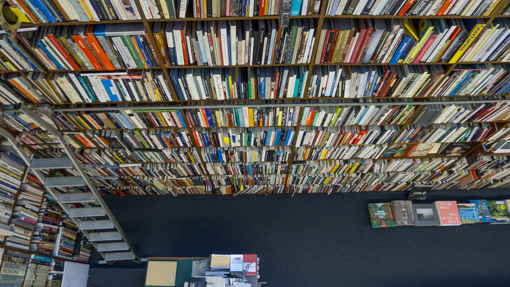 Warning: there are only photos of books here, stacks and stacks of them ! 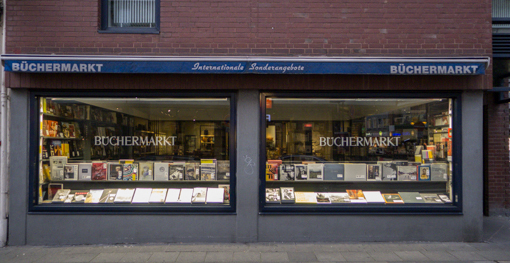 This bookstore simply named Büchermarkt (book market) occupies at least three floors of this brick building on Breite Straße 79 , 50667 Cologne. It may very well be a chain store and I just went to one of its branches. 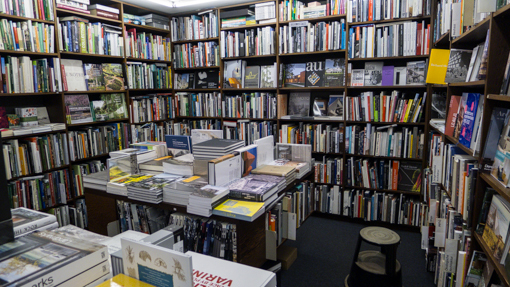 But this is one with the largest collection of art books I have seen recently. Very cramped and stocked with many different titles. 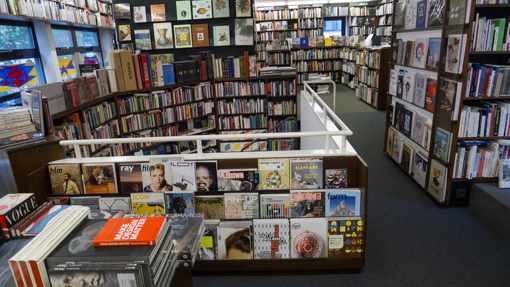 Near the entrance, they have the new and discounted books including many of the coffee table tomes put out by Taschen and Phaidon. And then it is just wall-to-wall books. From fashion to fine art to film. 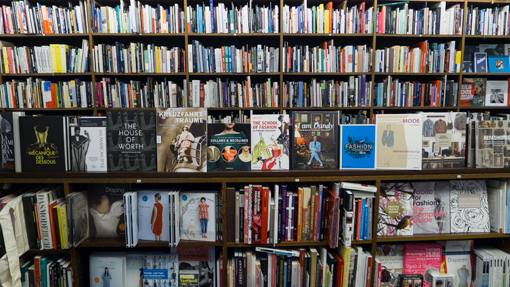 Even more liberal art and cultural books upstairs. 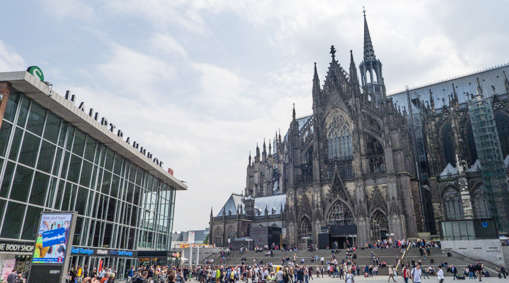 I read somewhere that Cologne produces most of the TV shows of Germany. There is probably a sizable population of media types to keep such a bookstore alive. There is a “balcony” where the two floors are connected by a double height space. Without this double height space, it can feel very claustrophobic. 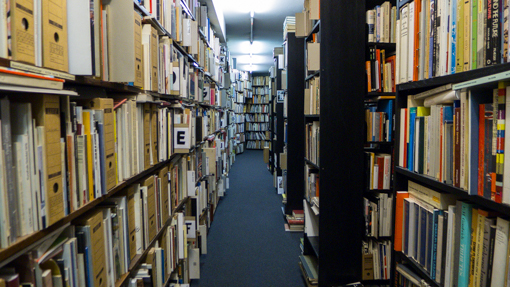 There is another floor… a narrow wooden staircase leading up … I have found the out-of-print section. 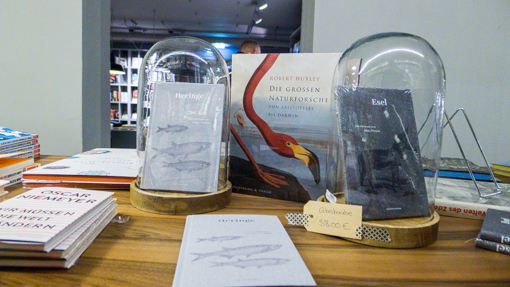 There are some Artists’ books (Künstlerbücher) on display here. There was a desk and a storekeeper at the top who asked me to leave my bag at the entrance. 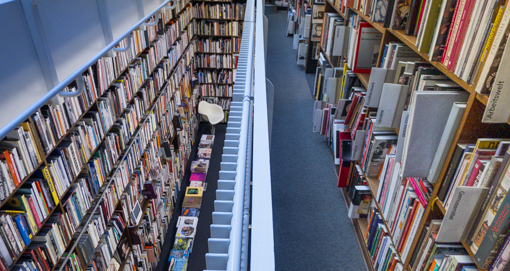 This place really felt like a library – the smell of old books. There were no price tags on the books here. Art books are full of pictures. I can spend days in here even I do not read German. I visited two very different bookstores in Cologne. 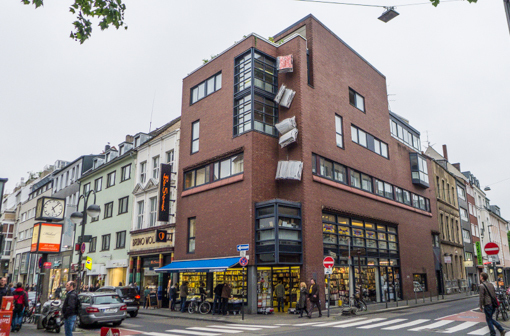 Located in the Belgian Quarter (Belgisches Viertel), see our earlier post about the area here. Siebter Himmel means Seventh Heaven. It was quite a surprising discovery since I had no idea of what it was supposed to be when I first walked in. 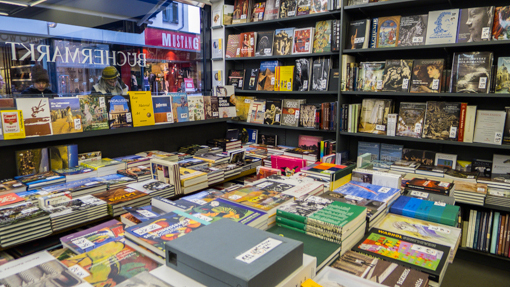 Is it a bookstore, a gift shop or … ? 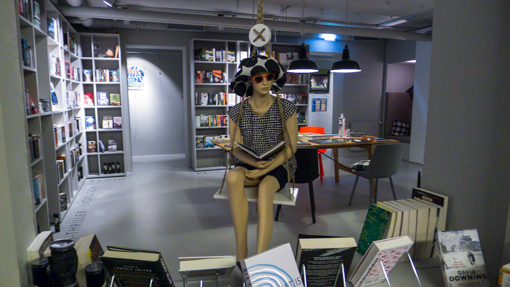 Well, a bookstore and lifestyle/design store. 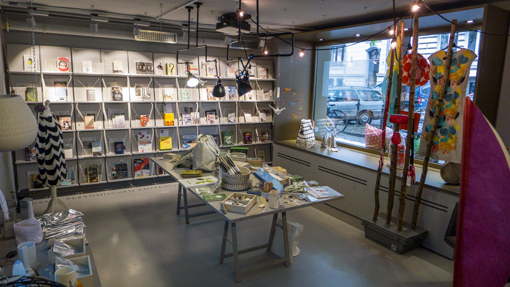 Our book and Design Shop “Seventh Heaven” was born from the belief that book and design can be connected to a special shopping experience. In a total of seven themed worlds, we satisfy your curiosity about unusual products, your right to quality and your desire for personal recommendations. … Expect the unexpected. Let yourself be inspired. Welcome to the “Seventh Heaven”. 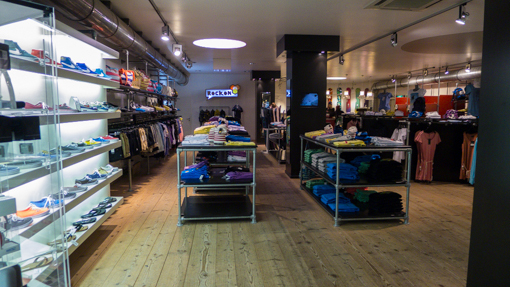 It is a small shop with a deep and narrow footprint but they have managed to create several distinctive spaces within it. Quite a feat. Mannequin on a swing ! Most of the books are in German. 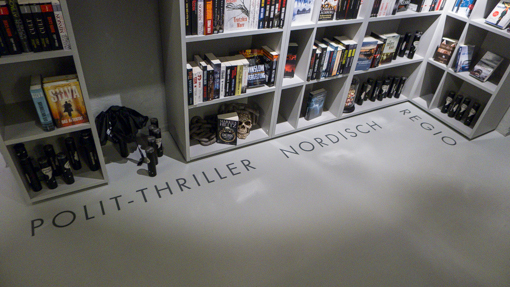 They further subdivided into thrillers into political, nordic and regional. 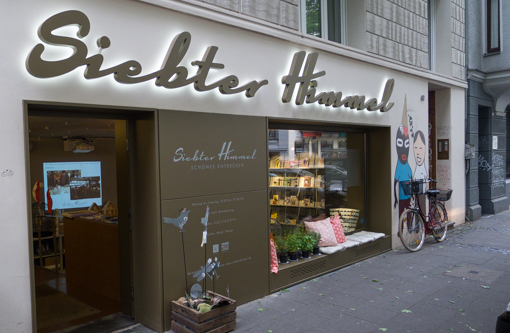 Siebter Himmel is one of the best lifestyle-themed bookstore I have seen. Glad that they did not have a coffee bar inside, just because every other bookstore already has one. 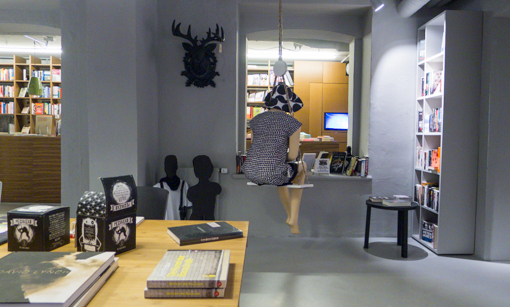 They sell clothings and music as well as design objects. Every city should at least have one such bookstore ! 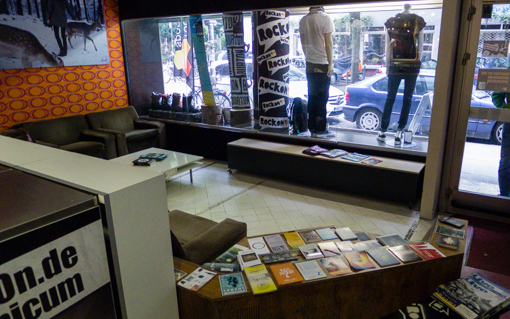 See my earlier posts on some bookstores in Sao Paulo here and here. 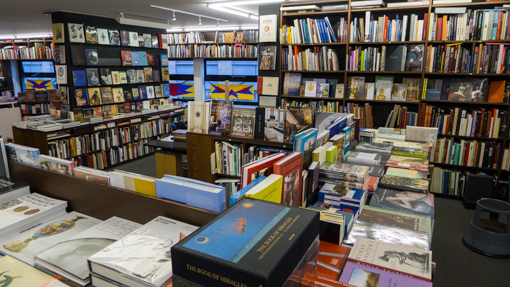 My next post is on a more traditional bookstore, also in Köln. 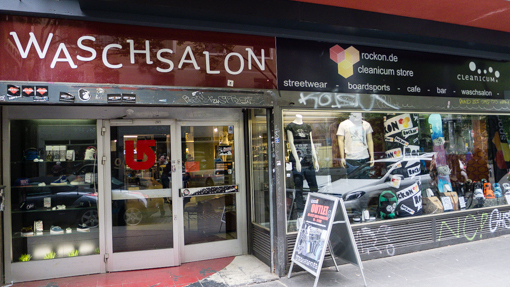 Continuing with my exploration of the Belgian quarter of Cologne (see earlier post here), I came across this unusual combination of enterprises on Brüsseler Strasse 74-76. 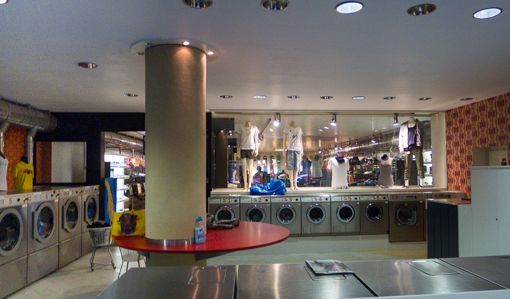 The shop floor is divided into two halves, the front is a laundromat while the back is a retail store. The two businesses share the same entrance. 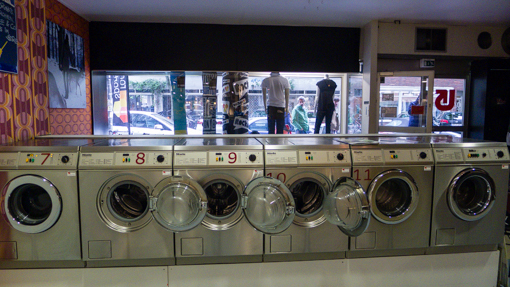 So one pass the washing machines and dryers before getting into the skateboard and street wear shop. This combination makes a lot of sense. I am not sure if they are both owned by the same business Rock On but their web site is here. 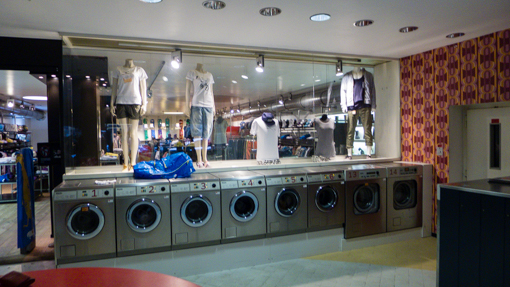 While the customers are waiting for laundry, they can peruse the merchandise of the store. The demogrpahics also make sense in that those who use a laundromat are likely to be interested in skateboard and paraphenalia. There is also a waiting area near the entrance where one can ignore the retail activities in the back. 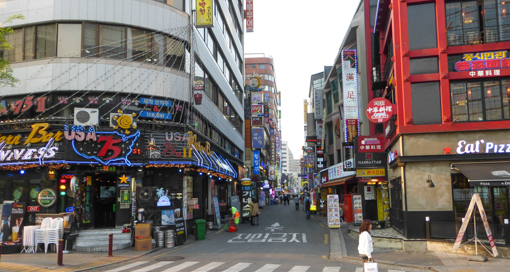 One can read the papers and pick up leaflets for concerts and parties here. But could the arrangement of the two businesses be reversed and give more exposure to the retail shop ? Just like supermarkets that place eggs and milk, the necessities in the corner furtherest from the entrance.